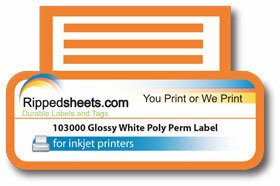 This glossy white polyester label stock has a clear acrylic adhesive that adheres permanently to many different surfaces. This material is often used by designers to mock-up glossy product labels. It is not waterproof, but can be made smudge, moisture and scuff resistant with the application of 100400 Clear Protective Spray. For best printing results use dye-based inks.